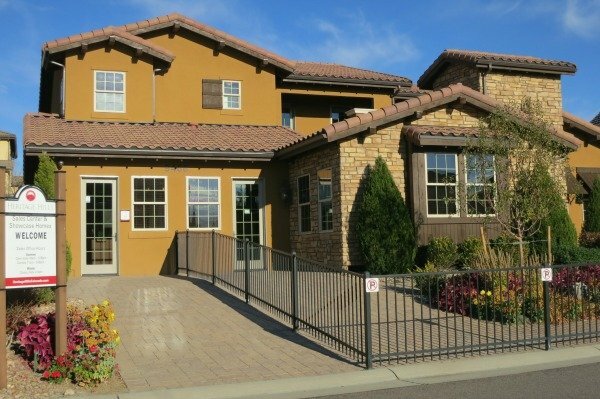 Heritage Hills offers new and resale luxury homes for sale in a gated-community. Moreover, the neighborhood offers its own amenities including huge swimming pools, tennis courts and parks for children. Also, Heritage Hills residents enjoying walking to the nearby light rail station and the Town Center of RidgeGate just across the street. These are the current Heritage Hills homes for sale. Celebrity Home Builders is selling brand new luxury homes at The Overook priced from $900,000. Celebrity Homes is currently building new luxury homes for sale in the Overlook. They are built in Tuscan-style and include a ranch floor plan as well as several two-story floor place. Outdoor space is emphasized. Many have interior courtyard similar to homes in Italy. Many also have expanded and covered patios in the backyard for additional outdoor entertaining. Interiors include many updates and extras included in the base price. Buyers often further customize each model. Custom upgrades and lot premiums can increase the base prices substantially. Those prices are generally just below $1m. Some resale homes for sale are priced under $800,000. One of the advantages of the new homes is the location. They are adjacent to one of the two pools in Heritage Hills. Tennis courts and a children’s’ play park is there too. And, these homes enjoy the shortest walk to the light rail station. As a result, it’s only a 5-10 minute walk to trains going to downtown Denver and the airport. Why drive downtown to fight the traffic and pricey parking? 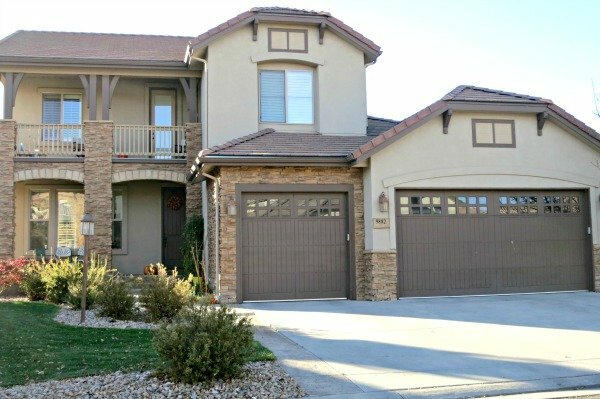 In Denver, your Realtor can represent you when you buy a new home. There is no additional cost to home for your Realtor to represent you and your interests. Remember, the on-site sales person works for the Builder and is the seller’s representative. So, a knowledgeable Realtor is the key to getting the best deal available. Ridgegate Town Center has restaurants, town-homes and employment including Charles Schwab. 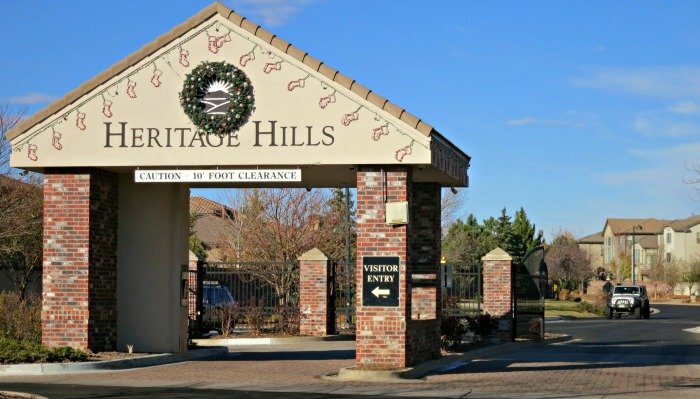 In addition to light rail access, Heritage Hills is conveniently located a short walk to RidgeGate, the “Town Center” of suburban Lone Tree. Discover the local restaurants and shops there. Also, the Lone Tree Center for the Preforming Arts offers music, theater and cultural events there. If you work at Charles Schwabb, Sky Ridge hospital or any of the RidgeGate employers, you can can even walk to work! The massive Park Meadows Mall is only a mile from Heritage Hills. Again, restaurants, entertainment venues and fabulous shopping is available there. Because, Park Meadows is one of only three destination, fashion malls in the entire Denver metro area. It’s anchored by Macy’s, Dillards and Nordstom’s with lots of boutique shops too. Big box stores such as Costco and Best buy surround the mall itself. 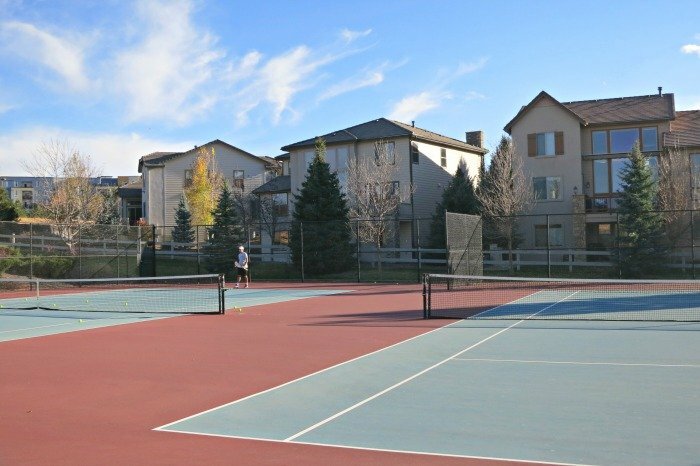 Tennis courts, large swimming pools and park are located within the gates at Heritage Hills. Top-rated Lone Tree Elementary School is the neighborhood, walk-in elementary school. Acres Green elementary is also an option. As a result, Heritage Hills is teeming with school age children. Nearby Highlands Ranch High School is the assigned high school and is also top rated. Also, several private and other magnet schools are available nearby. Cherry Hills Christian School and highly rated Valor High School are across the street from each other about 2 miles away. In addition, Saint Thomas Moore Catholic School serves kindergarten through eighth grades. Other magnet, charter and private schools are also options with a five mile radius. I’ve lived in Heritage Hills since 2004. Then, I built a brand new luxury home here. 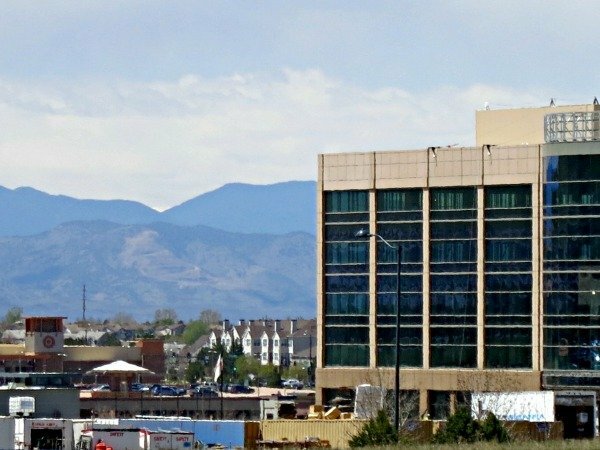 I personally love that only takes 3 minutes to get onto Interstate 25 to head toward the Denver Tech Center and downtown. Without traffic, my trips downtown take about 25 minutes. Also, the light rail to downtown takes about 38 minutes. And the trains to Denver International Airport take less 1.5 hours. I’d love to tell you more about my neighborhood. Please ;contact me to ask any questions on the form below.